Simon Ward hosted this webinar which gave some great advice on how to research and plan your qualification. Here are some of the things discussed. 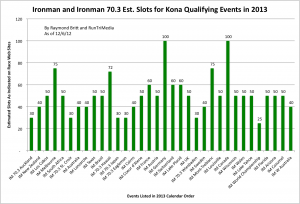 The likelihood is that you want qualify the first time you race an ironman so have a long term plan to get you to the start line at Kona. It may take a few races before you get it right. Most age groupers will manage one ironman race a season so your plan may be a couple of years or more. Do your research and choose a race that suits your strengths: a wetsuit or non wetsuit swim, flat or hilly bike course, hot or cool weather. You need to know the time that is likely to get your qualification slot so look back at your age group times over the previous 5 years, to set realistic goals for the swim, bike and run . And how many slots do they offer at that race? To prepare for qualification you need to ensure the environment around you is positive and does not add to the stress of training. So are your family behind you and prepared for having a tired and grumpy triathlete who wants to eat and sleep around long brick sessions? Are your work commitments for the next 6 or 7 months compatible with your training and recovery regime? Now focus on the training….look at your technique, the frequency of sessions and pacing across swim, bike and run. Is this combination going to get the result and times you require to qualify. Strength and conditioning is the key to preventing niggles and injuries which may put your plan on hold. So make time for S and C .
Understand how long it takes for you to recover from the session and the combined amount of training. Pro athletes can train 3 times a day as they rest between sessions; you probably have to fit recovery into work or family time. What is your nutrition plan and what do you need to change? This is not just on race day but from day one of training. Psychologically how can you prepare? During the race you will fall into a dark place and you need to have a coping strategy. So practice what it feels like to feel uncomfortable and find a solution. Now ask yourself the question , ” can you do this by yourself?” Who do you need around you to put you in the best place to achieve your goal. Now consider your investment to qualify and whether a coach a valuable addition to your plan to qualify as they can objectively set your programme to move towards the Kona goal.